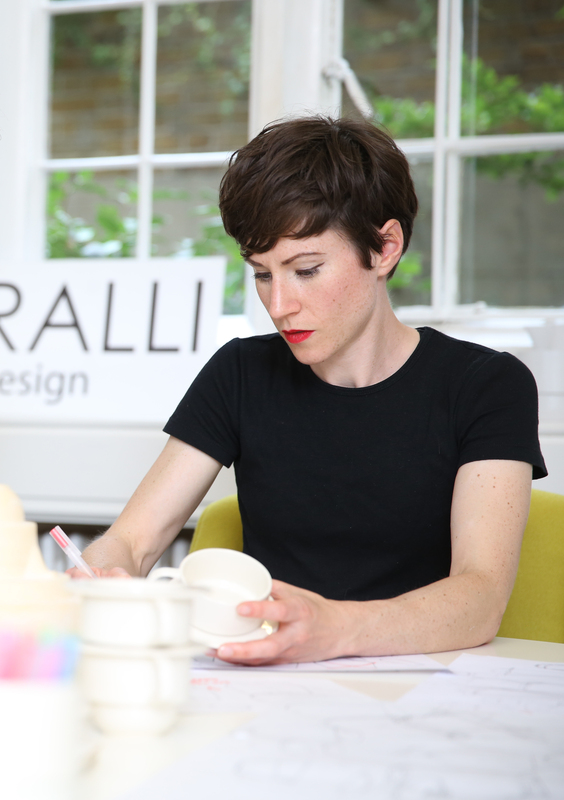 Sophie Ralli is Co-founder of London-based studio RALLI Design, whose products are available through UAL’s Not Just a Shop. She studied on the Foundation Diploma in Art and Design at Central Saint Martins and progressed to BA Ceramic Design, graduating in 2010. We design ceramic homeware products under our own label RALLI Design. Our current range is manufactured by Royal Stafford in Stoke-on-Trent and we’ve recently been tweaking the designs for our next range. We have also started to take on consultancy design work and have just come to the end of an exciting glassware project with a new brand that will be launching soon. When did you first decide that you wanted to work in ceramics – what drew you to that medium? I had been set on product design as my pathway at the start of the Foundation Course but when I was given the opportunity to experiment with ceramics for the first time it was a revelation. I discovered a medium in which the whole design process could be realised from inception to production and that appealed to me greatly. In 2010 I co-founded London-based design studio RALLI Design with my brother Louis Ralli. With a shared interest in manufacturing and clever designs for small space living, the ethos behind our products became “less clutter, more beauty”. In the early stages we produced furniture prototypes which explored ideas for small urban living. We then developed a series of ceramic products for the home and workplace that incorporated stacking and nesting elements as well as dual functionality. We also believe strongly that products should be designed to last and made responsibly using quality materials sparingly. How did your time at Central Saint Martins help to encourage the way you work? Studying at Central Saint Martins involved a lot of group work which was both challenging and thrilling. This gave me experience of working closely with others, which laid the foundation for the way we now work at RALLI Design. Central Saint Martins also taught me the importance of being self-critical and to always push your ideas as a designer. The ability to present work with confidence and communicate clearly has been vital for the projects we have worked on since graduating. In order to grow our business, we are currently reviewing our brand strategy to incorporate design consultancy work. Until now, we have mainly focused on producing products under our RALLI Design label. However, we realised there is a demand for us to be involved in a diverse range of projects, working with private clients and collaborating with other brands. How would you describe your experience on the foundation course? Without the foundation course I would have never been introduced to the ceramic medium. It was an essential stage in the development of my design identity – helping to hone in on the niche that would eventually become RALLI Design. Keep a totally open mind until you have tried out as much as you can and go with your gut because with passion comes success. What are your favourite memories of studying at Central Saint Martins? The comradery was one of the best parts, working alongside talented creatives in such a dynamic environment. I learnt lots of valuable lessons, had some really fun times and since leaving have retained a great network of industry contacts. Why should young creatives study a foundation course? To open their minds up to a wide range of possible directions. There is always more to discover than you think and you might surprise yourself.